Spring is in the air, and nothing says Spring but fresh fruit & berries. 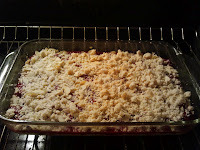 I had a hankering for some berry bars, but raspberries are still not quite in season. You can get them at the store, but for 4-5 dollars a pint! You need a lot of raspberries to make a good amount of bars, and well, we are on a budget like the rest of the country! So I opted to play with a bag of frozen ones instead. I added a generous splash of Kirsch to liven them up after defrosting. 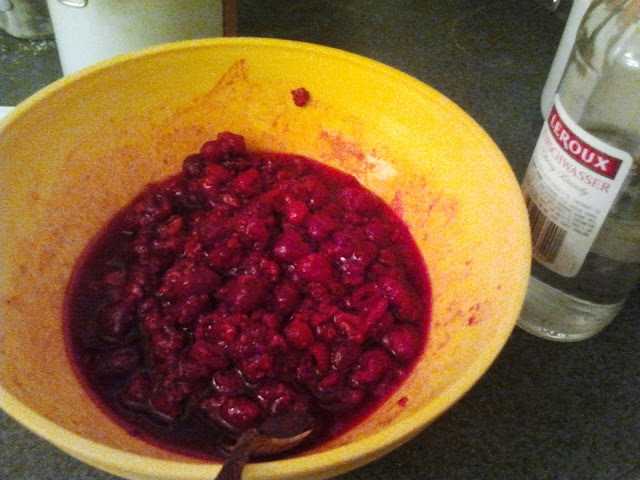 You can use any cherry or berry liquor you have on hand. You could even substitute Amaretto to kick up the almond undertones if you wish. You can also skip the liquor all together, and maybe just add a splash of lemon juice, orange juice or vanilla. This recipe makes tart bars. If you prefer a jammier, sweeter fruit flavor kick up the sugar a little in the raspberries. Enjoy the first signs of Spring! Preheat oven to 375˚. Spray a 13 x 9 pan with nonstick cooking spray and set aside. 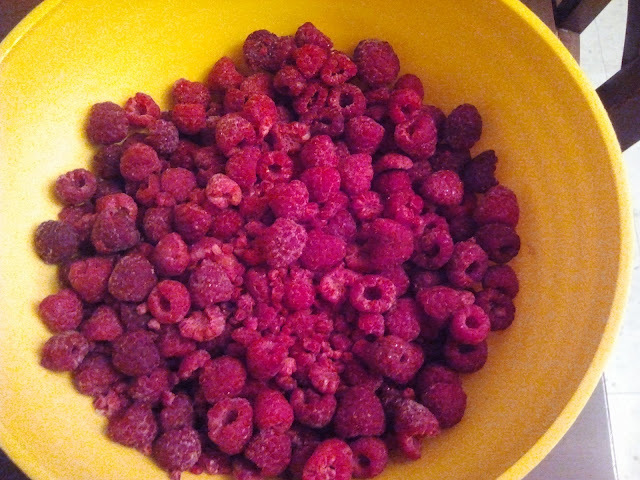 Pour the frozen raspberries in a medium size bowl. Let sit out at room temp. 1-2 hours until mostly defrosted. In a medium bowl, mix flour, 1 cup sugar, baking powder, salt and cinnamon with a fork. Cut the shortening into the flour with a pastry cutter and mash the flour until first the texture of cornmeal. Lightly whip an egg with a fork. 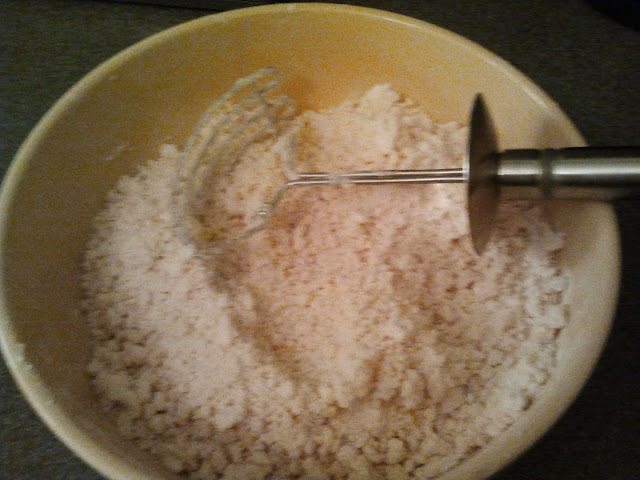 Add to the flour mixture and mix with the pastry cutter until large clumps form. Press with your fingers. Pour a little over half of the mixture into the pan. Press it down with the palms of your hands, creating an even 3/8" crust along the bottom. Reserve the rest of the mixture for the crumble top. To your defrosted raspberries, add the kirsch, 1/2 cup sugar and the cornstarch. Toss lightly to coat, but don't over mix with a spoon. You don't want to break up the raspberries too much. Pour evenly over the shortbread crust. 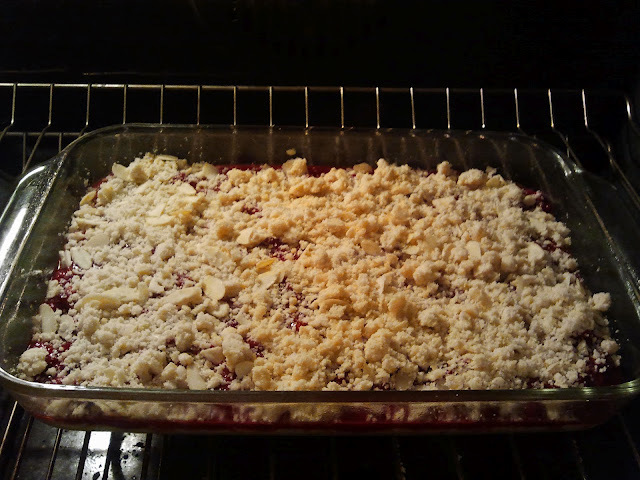 With the remaining crumble, add the almonds and mix. With your hands, sprinkle the crumble with the almonds over the top. It's OK if areas of raspberries are showing through. It is part of the look and the flavor. Bake on the middle rack for 45 min-1 hour. 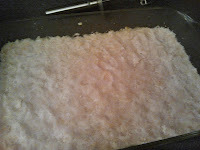 The crumble will have a light golden color and the fruit is bubbly and thick. Let sit out, cool and set for a couple hours before cutting. Store in an airtight container for a couple days.